Ireland winger Andrew Trimble was delighted to be among the try scorers as Ulster rejuvenated their European Champions Cup ambitions with a bonus point win over four times champions Toulouse at Kingspan Stadium. Trimble got the second of Ulster’s five tries for only his second touch down of the season and also topped the ‘metres made’ stats with 83 in the game. “Once you hit 31 and you haven’t played rugby in a year, I’d only scored one try this season and if you are not scoring tries as a winger you have to do a lot of unseen work. “I don’t want to be one of those wingers, you have to be getting over the gain line, making breaks, offloading and making tries so it is very pleasing just to get back on the score sheet. “To get back to feeling confident, feeling fast and my footwork is a little more dynamic than it has been. “I have been threatening to produce little glimpses of how I feel I should be playing. “It was only a couple of years ago when I felt I was producing the best rugby of my career that just doesn’t disappear, coming back from injury it is difficult to get your head space right. “It was quite new to me because I haven’t found myself in too much open space recently. “It was a little flashback to 2006 when I got a bit of space against Toulouse. I think the reason our backs haven’t found as much space as we would like is we haven’t had the conditions for it. “The last three or four weeks have been brutal and tonight was the night everything was prefect and we had no excuses and we had to go out and play the rugby that suits us and express ourselves. “I think it is important to get the crowd going again because we haven’t given them much to cheer about and they have been a little bit quiet as a result of that. The maximum point win lifted Ulster above the French side and Les Kiss’s men have a game in hand. “We never talked about the five points during the week, we really emphasised the process and play with the style of rugby that we are capable of. Trimble was happy with the overall performance. 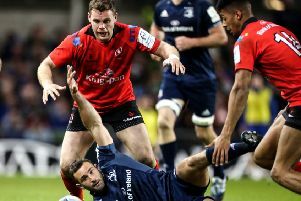 The sides meet again on Sunday and Trimble is wary of a backlash from a wounded Toulouse.